Some species of mice are notorious for finding their way into homes in search of food and shelter. At night, these rodents chew away at clothing, furniture and even electrical wiring. When mice aren't taking over your attic, they thrive outdoors in numerous habitats, creating nests and burrows out of natural materials. Mice make homes in different habitats, such as deciduous forests, open grasslands, farms, on the borders of streams, swamps and ponds, rocky mountains and city settings. 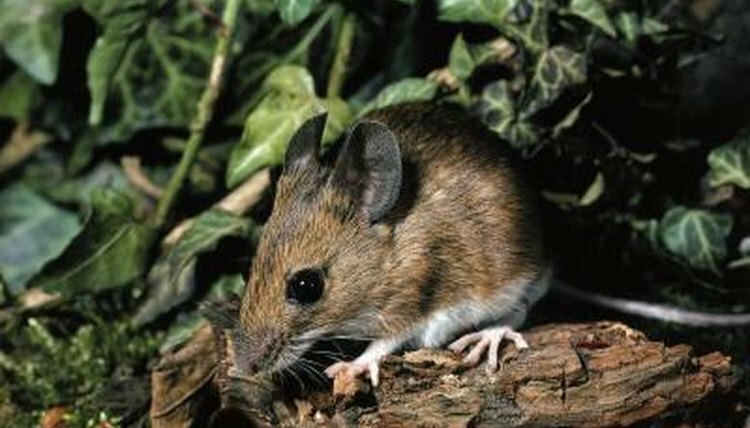 Mice are commonly found living in terrestrial environments at most elevations. Some mice prefer habitats with moisture and humidity, such as those surrounding water sources, while others, like the pocket mouse, adapted to survive in arid desert environments. Mice territories commonly overlap, especially if there are numerous species of mice in one area. Different species of mice take advantage of different substrates and housing options, depending on what their habitat provides. Some species, such as deer mice and house mice, build nests under rocks and stumps made of shredded plants and animal fur. Others live in shrubs, decks, wood piles, tree cavities and crevices of rock walls. Species like the meadow jumping mouse, pocket mouse and woodland jumping mouse take up home in abandoned burrows made by other mammals, plugging up any entrances with vegetation to avoid being found by predators. Most underground tunnels made by mice have different rooms that service purposes such as nesting and storing food. When mice aren't at home, they are on the move. Mice are excellent diggers, climbers, runners and swimmers. They enjoy checking out their surroundings, discovering new sources of water and food like berries, seeds and insects. Although they do enjoy traveling, mice rarely wander farther than 30 feet away from their established homes on a daily basis. Some species, like the meadow jumping mouse, travel much farther while in search of a suitable habitat -- up to 3,280 feet. Mice living in environments that experience winter have adapted their behaviors to survive. The proximity of mice to human dwellings is typically reflective of their habitat's climate and changing of the seasons. During winter, when temperatures drop and food sources are scarce, mice species like house mice move closer to human homes in search of warmth and food. Other species, such as wood mice, dig deep burrows, stuffing them with grass and leaves for insulation. Species like deer mice continue their daily lives around the snow, tunneling underneath it and taking up shelter in holes of trees. Mice sometimes even invite in other small mammals like squirrels to cuddle with them in their burrows to stay warm. Pima County Arizona: Where Do Mice Live Outside? Allstate Animal Control: Where Do Mice Live? Science Made Simple: How Do Animals Spend the Winter?